I sure do luvs me my Adobe programs. I think the first time I used Photoshop was when I was hired on in the animation department for a sign company out here in Vegas. I had no clue what I was doing. But after a friend of mine in the department took me under his wing and showed me a few basics, I was off and running. Photoshop, InDesign and Illustrator are my go to tools as much as a mechanic has his favorite hammer, wrench and screwdriver. There are other programs in the Creative Cloud Suite I use too, like After Effects for creating animation, Premier for audio editing, and Dream Weaver for working on web design. But at the foundation are the first three I mentioned. Those are my workhorses, and what a fine, fine team they are. But, as good as these industry standards are, not everyone can afford them. 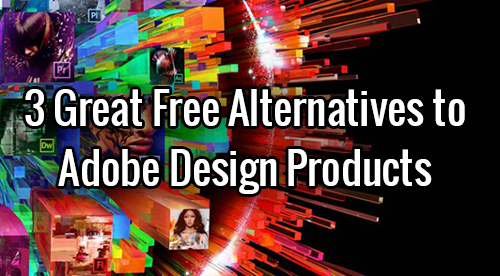 Although I have to say that a subscription to Adobe Creative Cloud is pretty decent and cost way less than in the past where we had to shell out thousands of dollars for a single program or the whole Creative Suite. Every day I see DIY designers trying to use programs like Word or… *gasp* dare I say MS Paint?…to design books and graphics. There are many options on the web like Picasa where you can manipulate an image and add effects and text, or PicResize to re-size images. These are all fine options, but wouldn’t you rather be able to do all this and more all in one place? Bring In the B Team! Last month I was asked to do a tutorial on creating vectors. I was all up for it, but the only way I knew how was through Adobe Illustrator. Many of the people requesting this tutorial didn’t have AI. Then someone in our Around the Studio Facebook group pointed out there’s an open source (free) version of it. That made me think, if there’s one open source for that, there may be others. And I was right. The programs listed below are very similar to the Adobe programs. They have many of the same tools as Adobe and the end product comes out the same, you really can’t tell the difference unless you look at the source files. For the sake of learning how to create a vector image; or design a simple ad, banner, or book cover; or lay out a book interior or online magazine, they work just fine. This program has been around for a few years now and is the open source version of Photoshop. I have used Gimp in the past and found it to be comparable to Photoshop. It has all the same tools, the ability to use layers, customizable interface, photo retouching and more. You can save your images as jpgs, pngs, gifs, tiffs and even as a PSD (Photoshop Document) file in case you have to exchange files with someone who uses PS. This also means if someone sends you a PSD, you’ll be able to open it and manipulate it. Gimp is available for Windows, Mac, and Linux. Click here to download and read more details. How many times have you tried laying out a book or magazine for print or digital publication in Word and have it come out looking nothing like it did in your Word document? Or perhaps you tried adding in images, only to get totally frustrated with the way the images won’t go where you want them to go, or the text won’t wrap right? That’s because Word was not designed as a graphics program. It’s missing a few key features that make desktop layout easier. While it can be done, it’s trickier. That’s why the pros use InDesign. The program makes it much easier to insert images, lay out text, get the wraps to wrap where you want them (even around odd shapes like circles) and so much more. Another advantage is being able to package up all your source materials (the original layout file, images and fonts) into one folder you can share with someone else working on the project or to send to a local printer to use. Scribus allows you to do the same things (except for the packaging, I’m not sure if they do that or not). You can also import PSD files or Gimp files. Scribus is available for Windows or Mac. Click here to download and read more details. Inkscape is the open source version of Adobe Illustrator in this OS family. Working in Photoshop/Gimp is fine, to a point. They’re good for manipulating photos, adding text to photos and importing vector images to your designs, but they don’t create the vectors themselves. Vector images are ones that can scale to any size without losing resolution. You can go from a 150px image up to billboard size and the image will retain its crisp, clean detail. Not so much with a jpg or png. For this, you need to create a vector image in a special program. After that, you can use it on its own to send to a printer, or import it into PS/Gimp and make it part of your design. Inkscape is available for Windows, Mac, and Linux. Click here to download and read more details. Welcome to A Whole New World of Possibilities! How cool is all this? Just think, no more struggling with programs that won’t do what you want them to do, and get closer to the professional results you want for those smaller projects you don’t want to hire out. I will tell you though, there is a big learning curve. Acquiring the tools is only half of it. Once you get them and learn how to use them, the next step is learning what actually makes good design. Should you decide you need help with that, let me know, I’m here for you. Contact me about one on one training in any of these programs, with a session designed specifically for you, or write in to Ask Blue and we’ll make a tutorial about it, or friend Wendi or me on Facebook and ask to join our Around the Studio group. Either way, we’ve got you covered! Did you find this post helpful? Share it! And sign up for our weekly ezine Around the Studio. « What Is Your Sales Value? I have the full Adobe suite but still just use Photoshop! Thanks for the resources — I’ll have to check them out! Kimberly Eldredge recently posted..What Does Ghostwriting Look Like? I’m the same way, Kimberly. There was a time when I used After Effects just as much, but now on the rare occasions when I have to do animation for a client, I open the program and I have to dig deep to remember what I remember! For anyone designing websites or books, the “Holy Trinity” of design programs are Photoshop, Illustrator and InDesign. The others in the Suite are certainly fun to play with and as ebooks get more and more advanced, there may come a time when After Effects and Premier (the audio editing program) might come into play more often too. Thank you for sharing this list of resources! I am new to the world of graphic design, and yes, using Word as a design tool is frustrating. Looking into purchasing the Adobe suite, but it is expensive. Great post! Try these freebies out, Ivette. And if you haven’t friended me on Facebook, please do so. Wendi and I have a private group called Around the Studio and we’re going to be offering special tutorials for the members there where I’ll be teaching aspects of these programs. Deb I recently canva.com which I call a graphic design program for non-designers. I Love It! I’m sure designers will find it very frustrating as there are no ways to measurement borders and spaces other than your eye. For non-designers it’s wonderful. I get in there and start playing and go into a trance. It’s addictive! I don’t know if I’ll graduate beyond canva but who knows! Maybe I’ll try one of these cool programs you shared. Thanks for reminding me about that one! Those programs are good for getting you familiar with working with images, but there will come a point where you want to do more. For example, making composite images and taking several different elements from different photos, masking them out and creating a whole new image. The advantage to that is you can start out with stock images, which everyone on the face of the earth can buy and use, and make something totally unique, thus lowering the chances of seeing your image on someone else’s book cover, banner or ad. Or making your own vector images, which can be pricey when you buy them off of royalty free sites or hire someone to make for you. Thanks for the resources Deb! It’s amazing how the technology landscape has changed and improved over the years. And at the same time, become more complicated to figure out what resourced work best given my needs and skill level. I think Entrepreneurs need to have a beat on this products in order to do some of the work themselves, before having to hire out the work. Thank for the list! I was looking for an alternative to Illustrator & InDesign. I tried GIMP, but found it to be too complicated for a PhotoShop user — it wasn’t intuitive enough for me. So a friend recommended paint.net. It uses most of the same tools and menus as PhotoShop. The main drawback for me is that you can’t constrain a drawing tool by using the shift key. Hi Sue! Yeah, there were little quirks about GIMP that if you were used to PS it made it a bit frustrating. In a pinch if PS wasn’t available to me anymore, I’d probably buckle down and learn how to use it better. You’ll have to tell me how the other two work out for you. Thanks for stopping by and hope to see you again!